Water Paper Paint is a fun book on watercolour and mixed exploration, targeted probably at beginners. There are three chapters in the book. The first covers the materials to use, second has 30 hands-on projects and the third features a gallery of mixed media artworks from various artists. The book features projects that use watercolour in unconventional ways. There are projects that teach you how to create textures and patterns by dabbing with different materials, or how to create effects with splatters, salt, leave stamping, mixing collage or typography, or even on how to make your own watercolour paint from pigments. There are also ideas on where to find inspiration, such as from photographs, poems, etc. There's nothing too technical and the focus is more on exploration and trying out different creative processes. 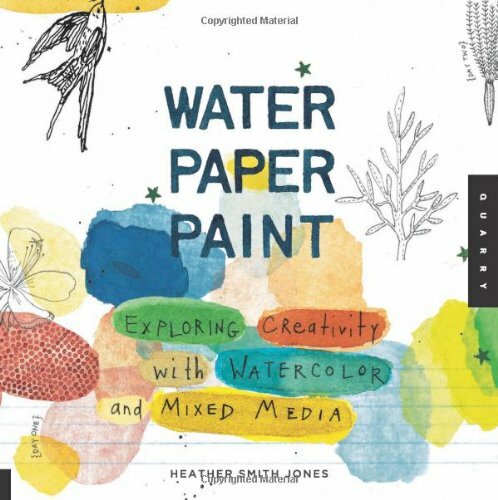 It's a fun book by author Heather Smith Jones for those who want to have fun with watercolour.